SAUSAGE SIZZLE - NEXT THURSDAY!!! Thursday 19th Feb. 4.00-6.00 Cheapside village hall. Come and join us for a hot dog, drink and cake (included in the price, extras individually priced) and a little bit of dancing and fun! Please bring payment to pre-school by Friday 13th Feb.in a sealed, named envelope. All proceeds to go to Cheapside Preschool & Rainbow Kids Club and The Nest children's home. Friends and family welcome, we'd love to see you all there! Please keep Thursday 19th/Friday 20th March 5.00 pm in your diaries, as we are trying to arrange the 'Sausage Sizzle' at the village hall. We'll confirm as soon as we can if we have the booking. Thanks to the wonderful support of our parents at pre-school yet again this year, we have managed to raise enough money through fundraising events to send another donation of £1,000 to The Nest. Huge thanks to every involved in organising, running and supporting our events last year! We also raised funds towards extra resources and activities for the children at our pre-school. Thank you all for your support. Summer Fun Day & BBQ June 29th! On the day we will need some help setting and clearing up and help to run a stall or the BBQ for half an hour. If you could volunteer please contact whittakerjenny@hotmail.com. We would be very grateful if people could brings cakes for the cake stall on the day. We will also need some goals and volunteer goal keepers. We are also inviting the children to come to Pre-school in fancy dress any day on the week beginning 23rd June 2014 in exchange for a bottle for our Bottle Tombola. For the second year running, we are proud to hold our May Ball at Northcote House in Sunningdale on Friday 16th May 2014. Tickets are on sale via the Friends of the Pre-school. FOPS are organising a teddy bear's picnic on Thursday April 3rd at CHEAPSIDE PRE-SCHOOL for the pre-school children from both settings. It's totally free, just come along with your child, bring a rug, a picnic and a teddy. Plus if you are able to bake a cake, please let us know. After the success of the May Ball last year, the FOPS are busy planning another ball at Northcote House this year..!! We'd love your feedback asap so we can know how many are coming as soon as possible. Please contact pre-school mum, Elaine Newall with any questions you have do with the ball and to let her know if you would like to come. In the meantime, can you help with any items/contacts for either silent or main auction prizes? Please also contact Elaine Newall: elaine.newall1@btinternet.com. 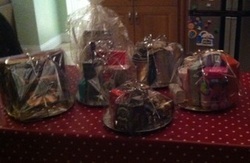 The raffle draw for our festive hampers takes place this Thursday at the Christmas party. Tickets are available to buy during the party so please have your purses and wallets at the ready...! Thanks to the generous contributions of cakes from our parents, and the effort put in by the FOPS team on the day, the Pre-schools cake stall at the Cheapside Village Christmas Fayre on Saturday 14th December was a great success! £100 was raised which will go towards the FOPS (Friends of the Pre-schools) fundraising targets for the year. This includes raising money for our new music, french and rugby sessions, which are partly funded by voluntary contributions from parents. Well done everyone for helping to make such a fun afternoon a profitable one too! A big thank you to everyone who came to the Sausage Sizzle on Friday, we had fantastic turn out of 67 people and raised £368! This will all go towards extra music and rugby sessions. A special thank you to everyone who brought cakes and helped on the night, it was greatly appreciated. We hope fun was had by all. Don't forget to put December 13th in your diary for the nativity and December 19th for the Christmas Party. Will information will follow. FOPS will also have a cake stall at the Cheapside Christmas Fayre (to celebrate the 65th birthday of the village hall) on Saturday 14th December at 2pm. There will be a range of stalls, competitions and a grotto. Contact Helen Halliday for more info on the fayre (Helen.halliday1@btinternet.com). If you are able to bake or donate a cake for the fayre contact Liz Shaladan (eshaladan@yahoo.co.uk) or Laura Browitt (lauramartin21@hotmail.com).